In an earlier post I wrote a tribute to Richard Schellen, the wonderful Redwood City librarian, now gone, not only makes researching Coastside history fun â- sometimes he turns it into one of those special âEureka!â? moments. A while back, I had one of those lucky experiences. While flipping through the Schellen Collection, I was zeroing in on Montara, when I became fascinated with a 1958 obituary. The subject was Owen Bryant, an amateur entomologist, who resided with wife, Lucy, and their collection of 200,000 mounted insects in Montaraâs historic two-story schoolhouse. Wow! A bug collector in the old grammar school? I had to know more. This is how it worked: The Schellen Collection steered me to the original newspaper article with the complete obit– and the Eureka! 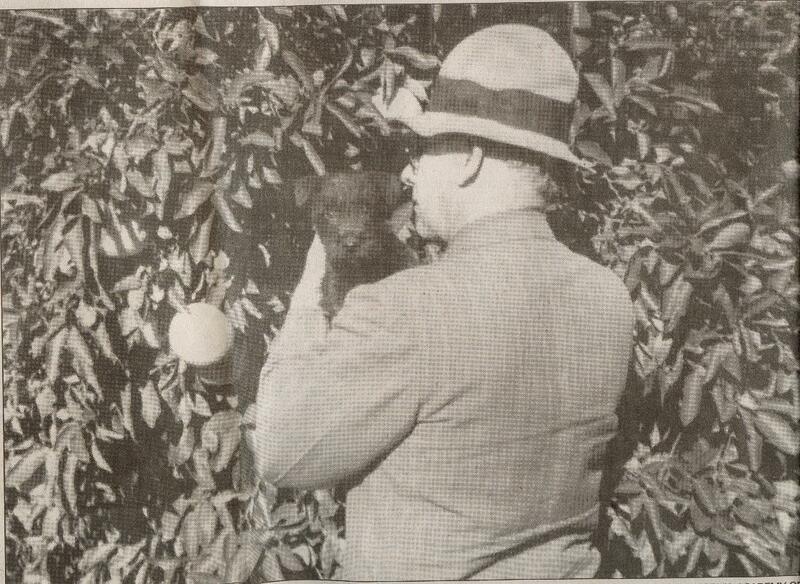 I needed to further my research: Owen Bryant had nurtured a close relationship with the California Academy of Sciences in San Franciscoâs Golden Gate Park. A phone call later, I learned that the Academy of Sciences had it all. Four years ago, on a rainy winter afternoon, I sat in the curatorâs offices, looking through several boxes of Owen Bryant biographical info. I also met Dr. Edward S. Ross, then the 86-year-old curator-emeritus of entomology. He had been with the Academy since 1939, an expert in 300,000 species of insects, but he was even more famous as a âclose-upâ? photographer. The walls of his office were covered with the extraordinary pictures of people, places and wildlife that had been published in college textbooks and National Geographic. In the early 1950s, Dr. Ross visited the Bryants at Montara, followed by dinner âat the restaurant (Frankâs) on the nearby beachâ?. Ross clearly remembered seeing the bell towers of the two-story Montara Grammar School from Highway 1. Ross remarked that the 60-x90-foot former schoolhouse had been converted into an unusual residence. On the first floor Owen and Lucy used a classroom as a bedroomâpushing their king-size bed up against the blackboard. One of the few things that brightened the surroundings was a museum quality of Mt. Resplendent in the Canadian Rockies. There were many boxes yet to be unpacked, including some containing Lucyâs inherited silver. None of Owenâs prized insects could be seen on the first floorâalthough upstairs there was a âbug roomâ?, office and library shelves overflowing with naturalistâs books bounds in fine Moroccan leather and gold tooling. 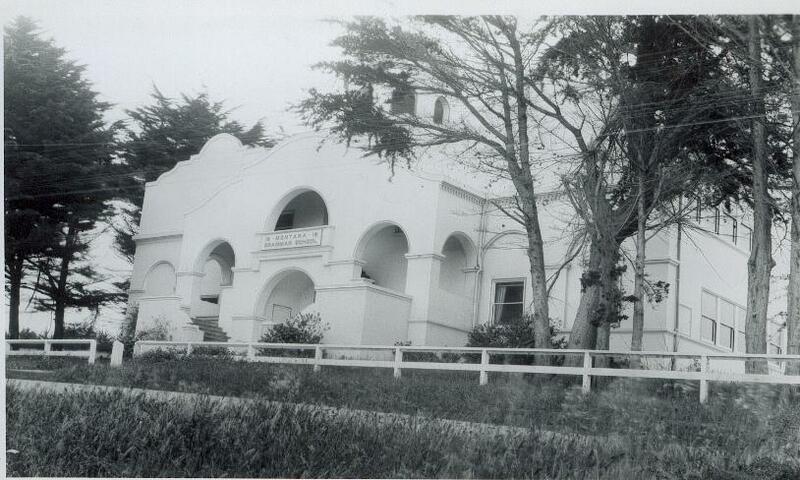 Photo at left: During the 1950s Montara Schoolhouse was home to the Bryants. Did the reclusive Owen and his vivacious wife, Lucy, find Montara dullâinsect-wise? They had just come from a favorite bug-hunting area on the outskirts of Tucson, Arizona. Insect collecting was outstanding there at the base of the Santa Catalina Mountainsâespecially during Arizonaâs rainy âmonsoonâ? season when there was a great burst of life in the desert at night. The wind was soft, the flowers were fragrant and it was âgangbustersâ? for beetle hunters. Owen, wearing bug-collecting gear, and armed with a stick, beat the bushes, overturning stones to unearth his prized insects. âOwen had a great time in Arizona,â? Dr. Ross told me. âFrom moment to moment he didnât know what kind of beetle was going to bounce in. It was like manna from heaven. Most people would say, âUgh!â Owen Bryant said, âAhh!â? Before settling down in Montara, Owen hadnât stayed put for very long. He and Lucy were rootless, always moving from one place to the next: Alaska, Banff, Canada, Steamboat Springs, If anyone wanted to locate the Bryants, all they had to do was find out where the beetles were flourishing and Owen and Lucy would be there. Dr. Ross said that Owen Bryant had moved to Montara âto be near the Academy. He came up here once a week with boxes of things.â? Owen needed the experts at the Academy of Sciences to identify his insect specimens. Sometimes he brought in a beetle that had never been seen before and the scientists named it. Beetles were Owenâs greatest interest and by 1950 he had donated 38, 530 specimens. Ross pointed out that many accomplished people were amateur collectors of insects. Charles Darwin, for example, was fascinated with beetles because of their tremendous diversity. At the Academy Owen Bryant found more than expert entomologists; he forged enduring relationships with the scientists and the institution. Dr. Edward Van Dyke, who had been there since the early 1900s âwas a famous beetle person,â? Ross said, âan M.D. who practiced medicine but his real passion was the bug collection he kept in the back office. Whenever the patients werenât around, Van Dyke was in the back room.â? Years ago, when I first started searching through old newspapers for stories on the Coastside, a helpful librarian steered me to the “amazing” Richard Schellen Collection. I cannot praise Richard Schellen enough for the work that he left anyone interested in local history, or a specific event, such as when a building was built or burned. Mr. Richard Schellen was once Redwood City’s head librarian, but I think of him as a librarian’s librarian. This wonderful man organized and typed up thousands of stories– either in their entirety or the first few sentences, (you could always find the longer original) –and he organized these stories by date and town, in some cases going back to the mid-19th century and earlier. In the Schellen Collection you can find political stories, business stories—murder stories….Perfectly organized by town and date. It’s a great resource. I wish I could have met Richard Schellen to thank him personally. He gave us writers and historians and the folks of San Mateo County so much. The Schellen Collection can be viewed at the main Redwood City library as well as the San Mateo County History Museum, located in Redwood City’s old courthouse. Here’s hoping you enjoy the collection as much as I did. 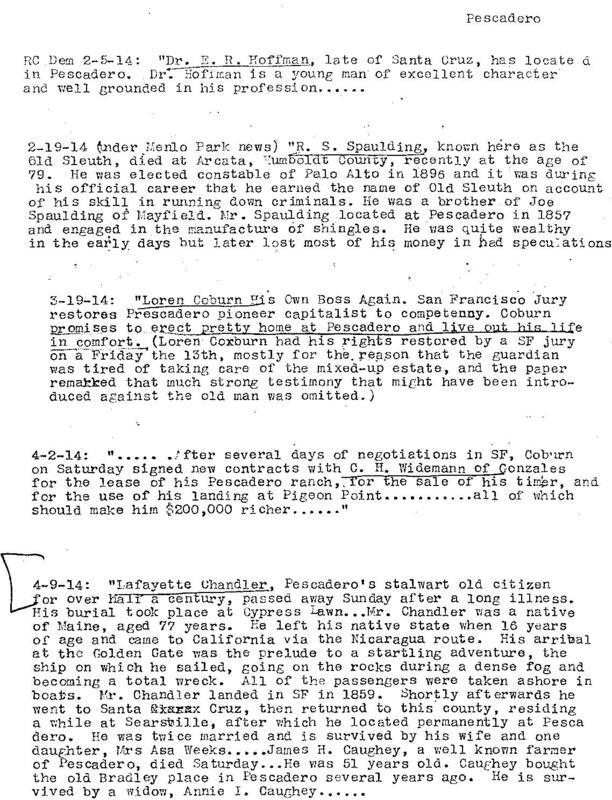 A sample page from the Richard Schellen Collection–this sheet lists a few stories about Pescadero. Click to enlarge.